Changes in aesthetic taste usually meant the substitution and later elimination from the church of certain decorative images. 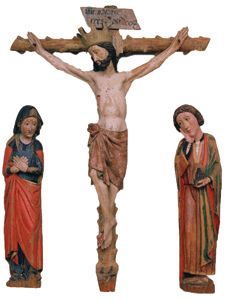 This Calvary from the mid-14th century was saved when changes were made to the Burgos church of San Pedro de Tejada, thanks to its position in the upper section of the late-Gothic main altarpiece. The quality of this piece is worth noting. Here, we see Christ in the center, flanked by Mary and Saint John, the only apostle to accompany him to the site of his crucifixion. All three figures have the same naturalist anatomy, with smooth, rounded shapes. Christ's expression is serene. On his right is the Virgin Mary, resigned and grieving. Saint John holds a book in his left hand, while touching his pained face with the other-a gesture which is quite common in representations of the Evangelist in medieval Calvaries. As the piece was being restored, its original polychrome decoration was recovered, revealing more details in the faces, clothing and the cross.